A quick postscript to the day from Rivera Notario shot in Santiago, Chile. it’s one of my favorites from the era. Anyone ever notice the resemblance of this “fastback” Chevy to the same generation Rolls-Royce, when viewed from the side? The Rollses had the window kink but the Bentleys were closer overall. And a year ago a CC writer made the same comparison. You have a good memory and an eye for detail. My reference to the 1949 Fleetline looking like a 1954 Bentley R-Type Continental Fastback was one short sentence in the middle of a long-ish post about three CCs in September 2017. Writers really appreciate it when commentors remember such details. Thank you. You read my mind as i want to ask the question…………who copied who? i believe this Chevy body style originates in 1949 and the Rolls/Bentley in 1951? CC effect: I was just thinking this morning about Chevy’s peculiar model names in those postwar years. The fleet line was Styleline, and the style line was Fleetline. I suppose they were thinking of the fastback as ‘fleet’ in a poetic sense, but most car buyers think of ‘fleet’ in a rent-a-car sense. At that time fleet was more of a reference to speed. Saying a person was fleet footed meant they were quick. There’s a beige ’49 Chevrolet Fleetline four-door fastback at a house a few blocks from where I live. Neat-looking car. GM’s postwar flirtation with fastbacks is fascinating. The most unusual in my book is the 1950 Olds 98 Town Sedan (pictured), though the 1950 Buick Special four-door Jetback is a contender. In 1950 Oldmobile blended the rear fenders instead of keeping them pointlessly pasted on like they were on the ’49 and on ’49 and ’50 Chevies, a big improvement on these bodies. Buicks did something similar. The 1951 Chevy finally blended them but with more or less the same old shape, like you just leaded the old style. 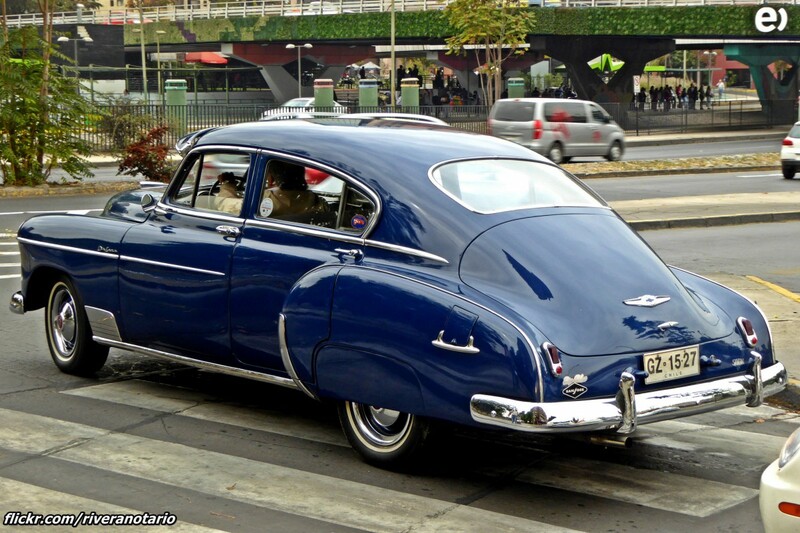 I prefer the 1949 C-body Buicks, Olds, and Cadillacs due to the separate rear fenders. 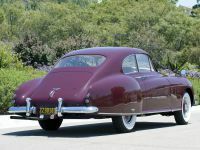 The blended fenders in the 1950 restyle gave the C-bodies bulging sheetmetal below the windows, which gave the cars a fat and heavy look. This style would last through 1953, and the Cadillac was perhaps the worst of the bunch. We only got the notchback 4 door sedans of this generation. A neighbour had a faded beige one when I was a little kid. This shiny, blue, fastback one looks beautiful. Were the fastbacks and notchbacks marketed as alternatives, or was one style regarded as upmarket of the other, or more modern? I note they were priced identically. I guess only GM could afford to offer buyers the choice. In 1949 I think that the Fleetline name was purposely used because it was similar to Fleetwood, giving little brother Chevy a little bit of big brother Cadillac’s aura. In the UK, Fleetline was a Daimler bus name, which always had a slightly odd feel to it, somehow. A GM fastback only equaled in beauty by the ‘78 A-body! The fastback style done right. …which may make William Hofmeister a copycat (that styling feature did not appear on BMWs until twelve years later). Beautiful, simply beautiful. I totally agree with Old Pete, the fastback style done right. I like these quite a bit now. But around 1960-63, when I was becoming very aware of the cars around me, these Fastbacks looked more dowdy than their sedan equivalents. Perhaps because before the Barracuda and later Mustang Fastbacks (and VW Type 3) appeared, Fastbacks that weren’t E Types or Ferraris were mostly old cars, or old-looking (VW Beetle or Volvo 544) so to my youthful mid, the whole style was old fashioned. By the way, I’m in the minority who liked, and still like, the ‘78 GM Aerobacks. Even as a really little kid I was aware of these and thought they were ugly. Still do. They are much more linear and more of an adaptation of prewar design ideas to a postwar envelope body than Fords. The Chrysler products were of course even closer to the prewar cars in design, but somehow I found the GMs, particularly the Chevies, to be the most annoying. Kind of long and skinny with teeny tail lights. But of course today if forced to choose I’d go for the fastback for its period appeal and uniqueness – everyone other than GM had dropped them. And a super nice DeLuxe like this one (with a few extra aftermarket or dealer installed chrome bits too) is certainly a cool period piece. But an equally nice shoebox Ford is a lot better. The only design element about the GM cars that is more modern than the Fords is that the windshields are curved, although split. Lincoln Cosmos have a one piece curved windshield but I guess Ford thought that was way too expensive, and maybe a lot more limited in production ability, for a Ford. A perfect period car is always way better than a messed with one. 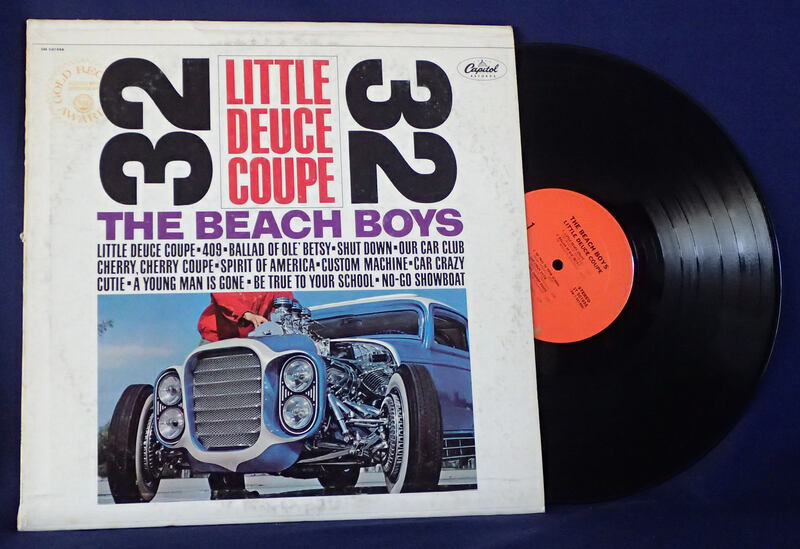 Unless you go all the way to something like the car on the cover of the Beachboy’s Little Deuce Coupe album. Which is now its own period piece. What a voluptuous teardrop. I just want to run my hands along it. (Read into that what you will. No, not that, have a cold shower, you). Much sweeter than the booted version. That roof is a ’40’s hat worn on a sloping ’40’s angle. Notice how the chrome window surrounds try to emphasize the appearance of one opening, with nothing on the B-pillar? I thought that was a more recent trick. Love the bottom bit of window chrome that keeps speeding on to point at the swoopy tail. Perhaps that’s the fleetline. Notice too the lovely miniature of the photographer in the left rear turn of the bumper. Just yesterday I passed one of these Chevys, though the “regular” sedan, on the side of the road….in the middle of rural Florida. That example looked like it had lost most of its paint. Looked for a For Sale sign as I passed but didn’t see one. I can’t say for sure if it had the requisite blue/antique auto license plate as I was too busy looking over the rest of the car. Although I prefer the details on the 51-52, these Fleetlines are just gorgeous. I don’t think anyone gave the fastback a better chance to thrive after the war than GM because they offered them in so many flavors. 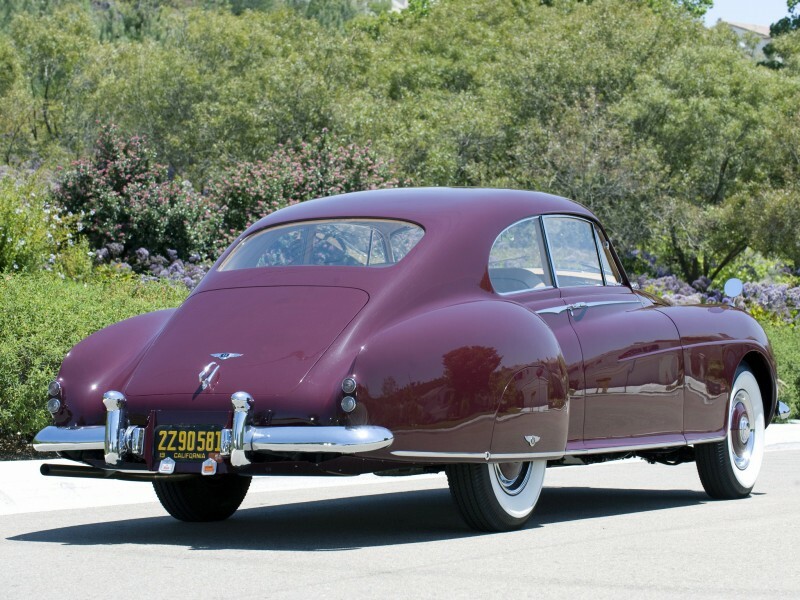 But fastbacks must have seemed old fashioned given their dominance in prewar styling, as they never sold all that well..
Ford just had one early-postwar fastback that wasn’t a pre-war holdover – the whale-like 1949 Lincoln Cosmopolitan and it only lasted one year. 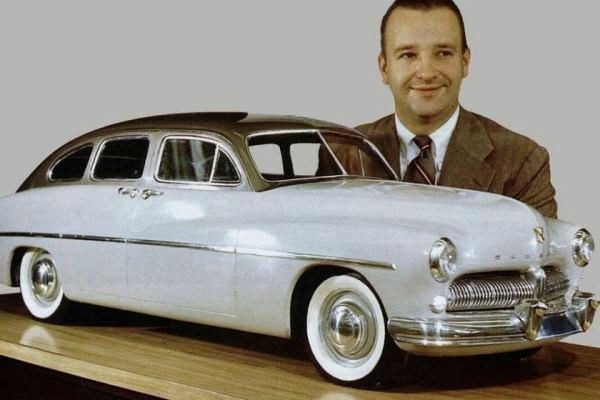 However, fastback versions of the junior Lincoln and Mercury were planned. I missed the party on the entry where everyone was choosing their favorite car from their birth year, so I will say here that, having been born in ’52, I would choose this car, but in a 2 door. I actually like the grill on the ’51 better, but it’s all good. They all have such “flow” to their lines. I find all that chrome to be a little excessive, but the ’50’s were the age of excessive chrome. And, given the way the newest cars and CUV’s are raising their hood lines, the “prow” of these cars doesn’t seem so excessive any more. Although I am a “Ford Fan” of this time period; I would be quite pleased to add a 1951-52 4 door Chevy Fastback, in the factory color that approximates “Air Force Blue”, with a transplanted small block Chevy V8 engine, into my driveway. In the movie “L. A. Confidential” one of the detectives drives a light colored, 4 door Chevy fastback; you can hear him revving the beejusus out of that Stovebolt 6 engine several times in the movie. Dont forget Angel heart where Mickey Rourke drives a 51 sedan. Great movie!! Lots of movies – movie stars can’t drive stick. IIRC: Mickey Rourke was driving a 4 door rental Plymouth?